On a warm, late spring day in Minnesota, I opened the back door and suddenly stopped in mid-step. There, curled up and sleeping soundly on the doorstep, was a tiny bundle of baby bunny. How in the world did this little critter wind up here? No basket. No note. 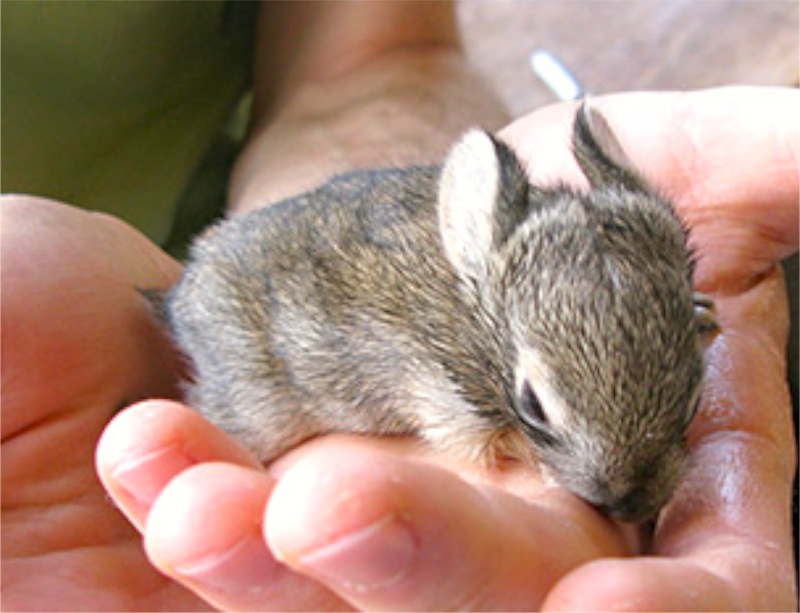 Just one impossibly small bunny. I brought it inside and made the best bunny nest that I could manage and tried to figure out what to do with the little orphan. It was sleeping soundly but when it woke up, it would probably be hungry. I opened the back door again to call our dog. “Cinnamon! Come on girl!” No response. I started to step outside and again, stopped in mid-stride. Another baby bunny on the doorstep. This one was awake and seemed healthy. There did seem to be a bit of dog slobber on its soft fur, however. I caught a glimpse of Cinnamon’s tail, matted with burrs, as she disappeared around the corner of the house. What was that dog up to now? I stood there puzzling with a second bunny cradled in my hands. After a long while, our Golden Retriever, trotted back to the door and gingerly placed a third baby bunny on the doorstep. Down she sat and looked up at me with cockle-burrs in her ears, and concern in her brown eyes. I suddenly realized what had happened. Our dog was not the rabbit-chasing type, but we lived near the woods, and once in a while, a wild animal would be hit by a car on the road nearby. 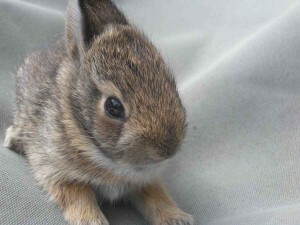 The mother rabbit must have been killed, leaving behind a brood of babies with no one to care for them. Cinnamon had found the orphans in the forest and brought them home. This was the summer that my mom was laid up in bed with a couple of herniated discs putting excruciating pressure on her sciatic nerve. She had to stay in bed flat on her back for weeks. She was not a happy camper. This was the kind of mom who needed to be busy all the time. If she had hatched out as a bird instead of a human, she would be a hummingbird. She needed to be in perpetual motion. She needed to be needed. Now she was forced to lay down and stay put. She had reached the point of despair when the bunnies arrived. They needed care and she needed a cause. We put the cage with bunnies and grass and sweet clover on the bed next to her. She helped make sure that they were fed and nurtured. They made sure that she was no longer bored to tears. The dog checked on them once in while, just to make sure that their new mom was doing a good job of mothering. The bunnies slowly grew and my mom’s back slowly healed. 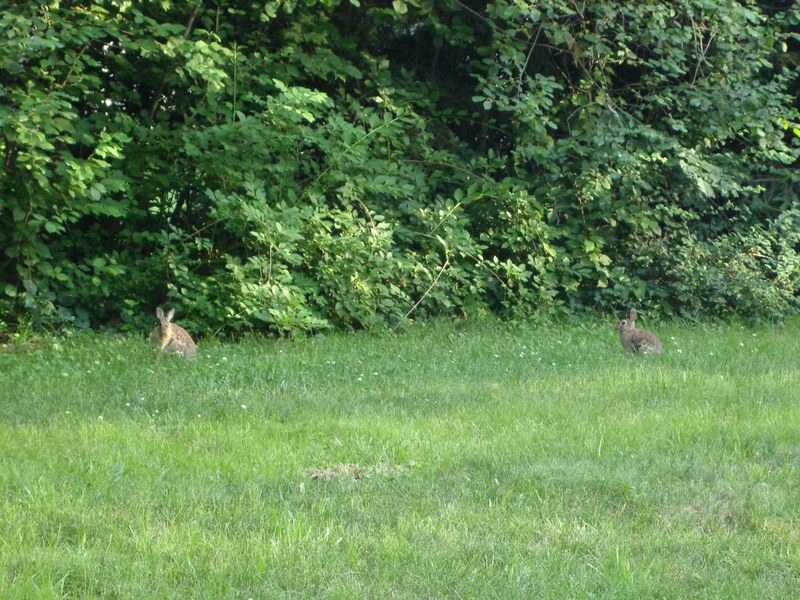 Came the day when my mom could finally get out of bed and walk, and the bunnies were finally big enough to take outside. We set the cage down near the edge of the woods and moments later, they had disappeared into the arms of mother forest. ← Second Author Visit at Waseda International School!